The last time I wrote a letter was to my aunt two weeks ago but I'm afraid I typed it and just wrote my name in ink along with a couple of kisses. A few weeks before that I wrote some notes to friends who had lost their mother and that was pen and ink. I think it does make a difference to use pen and ink when you really need something that is much more personal and heartfelt. Thank you for making me think about it a bit more. You're right, I haven;t written a letter in forever. But I do hand write bits of my novel and story ideas every day. Does that count? I recently wrote a check, made out to the "US Treasury." Does that count??? 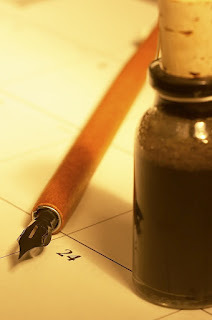 I find that writing with pen and ink rather than typing helps writer's block as well as editing. I edit online and then I go back and edit actual pages. Makes it easier to see mistakes, for some reason. Sally, you're half way there! Jay ...um, no. And writing anywhere that involves the US treasury is not cool. That's sad. Do you still have the shirt on your back? Sara:Me too! Major writer's block overcomer. Lynn: Yes, it's a reminder to me too to always have stamps handy! I write in a notebook daily - typing uses a different part of the brain to writing - good to exercise both. Great post. I try to send my grandfather a handwritten note, inside a blank card, at least once or twice a month. I've been doing all of my writing and journaling by hand this year.